Reflecting bamboo's versatility, its uses in the landscape are numerous and varied, with plantings often serving multiple purposes. A few of the most common uses are discussed below. PRIVACY SCREENS: This is probably the most common use of bamboo in US landscapes. With the ever-growing population and the ever-shrinking size of residential lots, privacy is something many people value but have little of these days. Bamboo can be used to provide a fast-growing evergreen privacy screen in many parts of the country. While bamboo choices will vary by region, for us in the Deep South there are plenty of non-invasive clumping bamboos that provide excellent screening effects with varied heights and forms to fit almost any site requirements. 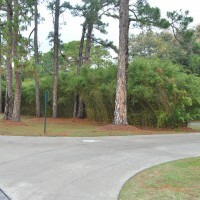 Further north, there are many cold-hardy running bamboos that may be used similarly, although a rhizome barrier or other containment method is suggested for screens along property lines. There are also a few cold-hardy clumping bamboos that may be used in colder climates. WINDBREAK: In our part of the world, many homes are surrounded by large, open agricultural fields and are exposed on all sides to frequent high winds. Hurricanes and the high winds that accompany them are also a fact of life in the Deep South. Bamboo can be used to provide an effective and fast-growing windbreak to protect homes from wind damage and to allow people to enjoy their yards without being literally blown away. In addition to rapid growth, one other advantage bamboo has over trees for windbreaks, screens, etc. is resilience. High winds often blow down trees which then have to be removed, leaving a gap in the "windbreak" or screen which may take many years to replace. With bamboo, high winds may snap a few canes, but these are easily pruned out and in most cases will be replaced in one growing season. Similarly, downed trees sometimes come crashing through the roof, but since bamboo canes are hollow and relatively lightweight, bamboo may be planted near houses without worry of severe damage. Instead, bamboo can actually form a protective envelope around homes during hurricanes or other high wind events. As with privacy screens above, the best bamboo to use will vary by region and site conditions, but there are many non-invasive and running bamboos that can be used as effective windbreaks. NOISE BARRIER: In the modern world, noise is an all-too-common fact of life for most people. Whether it's noisy neighbors, noisy traffic, industrial noise; whatever the source, the dense growth habit and foliage of many bamboo varieties can help bring a sense of peace and quiet to urban as well as rural surroundings. DUST BARRIER: As mentioned above, there are many large agricultural fields in our neck of the woods. These fields are usually plowed several times per year, exposing the topsoil and often generating dust storms during the windy, dry conditions which have been all too common recently. In other parts of the country, dust sources are many and varied. No matter the source, dust or other air pollution is a nuisance and often a health hazard for those living and working nearby. The dense foliage and growth habits which make bamboo an effective privacy screen, windbreak, and noise barrier, also make bamboo an excellent dust barrier. Whether your house is surrounded by agricultural fields or sits next to a rock quarry, power plant, highway, etc., bamboo can be used to moderate the dust, air pollution, and other environmental extremes you are exposed to on a daily basis. EROSION CONTROL: Bamboo's dense, fibrous root system is excellent for holding the soil and preventing erosion on otherwise erosion-prone sites. The groundcover bamboos are especially useful in this regard, since they are often used as understory along stream banks, etc. Taller bamboos also excel at erosion control on sunnier sites. 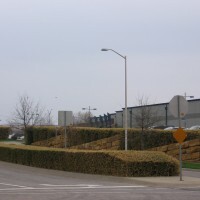 SHEARED HEDGE: Many otherwise taller bamboos may be maintained as a sheared hedge for a more formal appearance. They may be shaped similarly to other common hedge-forming plants and will usually require only two prunings per year to maintain the desired form. Additionally, if a taller pruned height is desired in subsequent years, it can usually be achieved within one growing season. GROUND COVER: There are many species of groundcover bamboos available and most are fairly cold-hardy. In the Deep South, most groundcover bamboos prefer part- to deep shade, but some can take a good bit of sun further north. Maximum height of the groundcover bamboos ranges from a few inches to a few feet tall. 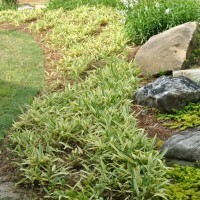 In addition to the numerous all-green forms, there are several variegated selections available which are especially useful to brighten up shady spots in the landscape. TROPICAL SPECIMEN: Bamboo may be used to add tropical beauty to any landscape, even in colder climates. The taller bamboos with large-diameter canes are especially useful in this regard, as are some of the large-leafed shrub bamboos. When used around pools or other outdoor gathering areas, bamboo adds a unique tropical touch to the landscape unmatched by any other group of plants. When combined with palms and other common tropicals, bamboo can help you create your own backyard tropical paradise! SPECIMEN GROVE: Anyone who's ever walked through a well-maintained grove of large bamboo knows that the feeling is surreal. While the running bamboos are most often thought of as grove-forming, clumping bamboos may also be planted to form groves. A bamboo grove is a special place that can provide sanctuary from the outside world – a good place to hang a hammock, sway in the breeze, and daydream! A bamboo grove can also be used to fill blank spots in a landscape, providing a unique visual impact from outside as well as from within. 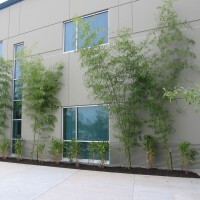 FOUNDATION PLANTINGS/ARCHITECTURAL SCREENING: Bamboo's lush, evergreen foliage and it's tendency to sway with the breeze can soften the harsh lines of commercial as well as residential buildings and also screen utility boxes, air conditioners, etc., while providing a unique and attractive appearance. WILDLIFE HABITAT: Birds love to nest in bamboo! River cane, one of the bamboos native to the US, is actually said to be the preferred nesting substrate of the Hooded Warbler. We have observed many other birds nesting in various native and non-native bamboos and also using the foliage for nesting material. Bamboo also provides cover and even food for many other wildlife species. Rabbits especially love the tender shoots and new plantings sometimes have to be protected from them until the bamboo is well-established. BIO-REMEDIATION: There is vast potential for bamboo to be used more in reclaiming damaged or abused land and preventing run-off from large livestock operations, factories, and other agro-industrial facilities. Bamboo excels at nutrient uptake and helps protect and improve soil, air, and water quality while moderating the environmental stresses imposed by the modern world. With the wide variety of available bamboos, there are opportunities to use bamboo in almost any landscape. However, it is critical to choose the right bamboo for the intended purpose and site. We look forward to working with you to ensure that your bamboo experience is a positive one!